This download contains eleven graphic organizers for you to use throughout the writing process with your secondary students. 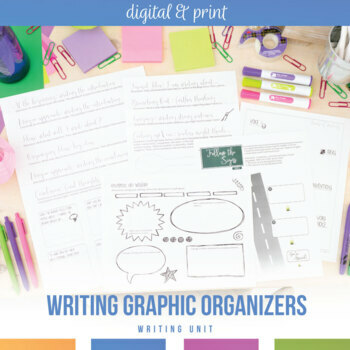 I use these writing graphic organizers with narrative, expository, and argumentative writing assignments. → Traits of writing organizer. Use this for connecting to rubrics, defining ideas, and establishing expectations. → Four brainstorming options. 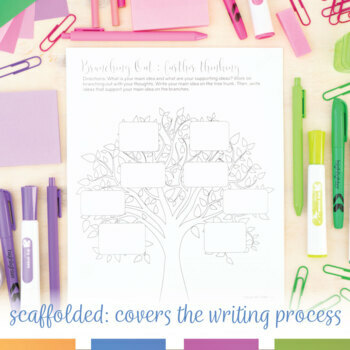 Included are a web and a tree (for students to branch out with their ideas). Two other organizers guide students as they organize and narrow their topics. → Sentence structure graphic organizer. 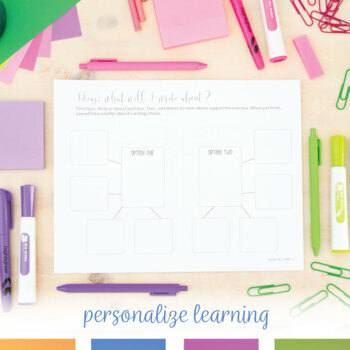 → Editable teacher lesson plans and teaching ideas. With the introduction and conclusion graphic organizers, I encourage students to choose what graphic organizer will be most meaningful to them. You should be able to see pictures of ever writing graphic organizer in the preview and thumbnails. Answer keys are not included. If you need more details about this product, this blog post will help.